Construction workers in the West Bank settlement of Ariel. Such Israeli settlements have expanded in recent years. United Nations Secretary-General António Guterres today reiterated his support for a two-state solution to the Israeli-Palestinian conflict, voicing concern about the latest decision to build a new settlement in the Occupied Palestinian Territory. “The Secretary-General took notice with disappointment and alarm of the decision by Israel to build a new settlement,” according to a statement from his spokesman. “He condemns all unilateral actions that, like the present one, threaten peace and undermine the two-state solution,” the spokesman added. The UN and the international community have for years urged the establishment of a Palestinian state living side by side in peace and security. The settlement noted also that settlement activities are illegal under international law and present an obstacle to peace. 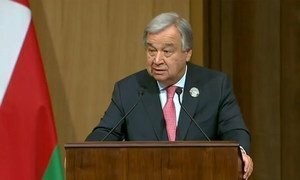 Addressing the League of Arab States Summit in Jordan today, United Nations Secretary-General António Guterres highlighted the importance of unity among the countries in the region to confront the challenges it is facing.